I drew this just now, and I'm almost done. But, I need to figure out what color the rest of the background should be. I eat it to be a solid color. I've included a picture of my picture and the other color options. I don't know which to use, so I thought 'why not let the people of the Drawing club on Fanpop decide?' So that's what I'm doin and that's what your doing! Help me decide, it would be a great help! 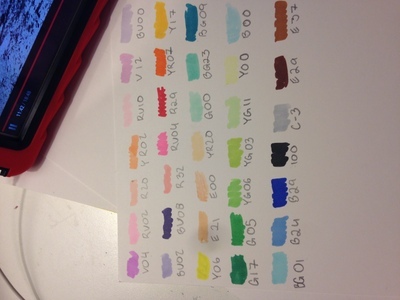 Below are pictures of my drawing, and all of the colic markers I have. Don't pick BV08, as I've already used it as the color surrounding the girl. Thanks to whoever gives me an idea! Also, tell me how u like it! I just drew a picture of a girl who acts calm but is really crying on the inside. I'm s depressing person… LOL! Seriously though, thanks for any answers. Choose all shades of blue if u want to make it dark.If u want to make it light so use R29,YR07,Y17,Y06.Don't mind if u didn't like it. I always used color like that.